MARCH 16, 2010 UPDATE: Sorry guys, I lied. These 1 ounce bars are not available and have for nearly a year said "coming soon." I'm sorry to disappoint everyone with the following article. That's right, folks, our friends over at Cohen Mint are planning to release a 1 oz rhodium bar within the next month! Cohen Mint is by far the front runner in the rhodium coin market. In fact, the company has no rivals. If you're looking to invest in rhodium you either invest in stocks of a nickel mining company that has palladium, platinum, and rhodium as by-products, or you invest in a company like Stillwater Palladium Mining or Impala Platinum which also pulls some rhodium out of the ground, but neither of which focuses on rhodium (note: I haven't researched how to invest in stock of companies that mine rhodium, so understand that there may be more ways than I mention). But, in the spring of 2009 Cohen Mint started producing one gram rhodium coins! Now, we're going to get a quarter of 1 ounce rhodium coins and 1 ounce rhodium bars! Here are a few photos of the current 1 gram rhodium bullion coins. have been available most of 2009, click here. The proposed 1 ounce .999 rhodium bar looks like it will be pretty nice looking! I like the design and love that it will be double stamped. What I mean by this is that the sheet of rhodium will be stamped on the front, after which it will be stamped on the back. Some bullion bars are only stamped on one side and while they are worth the same (the weight of the metal, the back sides aren't shiny). The new Cohen Mint 1 Ounce Rhodium bar will have a small stamp showing Eitan Cohen's design of a night on the horse. This is a good choice because it's the same design that's on the front of the one gram rhodium coins. 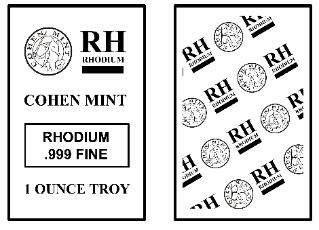 As you can see in the photo the proposed stamp will also state the chemical symbol of rhodium, RH, "Cohen Mint," "1 OUNCE TROY," and "RHODIUM .999 FINE." The rear of the coins take some styling from other bullion products, such as the Engelhard Silver Bars (see left). 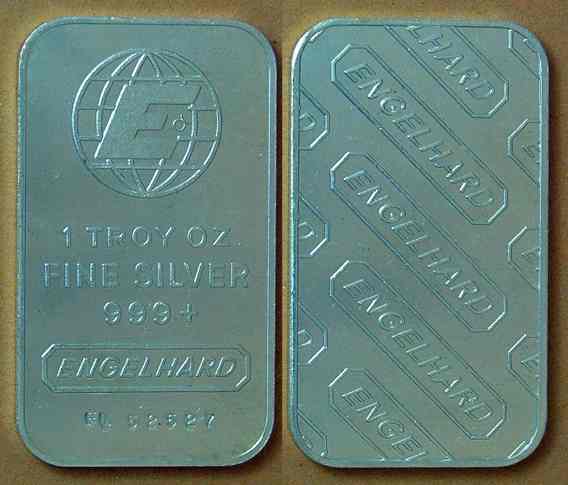 Engelhard has versions where the rear if the bullion bar has "ENGELHARD" imprinted into the bar. The angle of the writing is quite stylish. 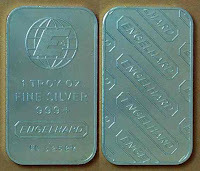 However, as you can see in the photo to the left, the bar has the rest of the bar stamped so that "ENGELHARD" is raised above the surface of the bar, similar to the date printed on the coins in your pocket. While this is more attractive, due to the intricate detail of the design, I'm expecting the marks will be recessed into the bar. But the Cohen Mint has surprised us in the past, so we'll see! When you hear the Cohen Mint is going to make a 1 ounce rhodium bullion bar, you're excited. But when you go the site, there's a surprise waiting for you: the Cohen Mint will also make a 1/4 ounce rhodium coin! 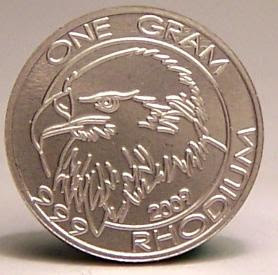 The 1/4 ounce rhodium bullion coin will look similar to the 1 gram rhodium bullion coin pictured above, however, since the coin is about seven times the weight it will have approximately twice the surface area of the 1 gram coins. 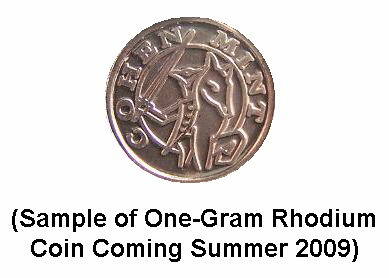 To put this into perspective, if the one gram rhodium coin is a dime, the 1/4 ounce will be a quarter (no, that isn't the exact size, but similar). And below you can see the proposed design. Very nice looking coins. We're hoping these will have less of a premium for fabrication costs because, it takes approximately as much work to make a 1 gram coin as it takes to make a quarter ounce rhodium coin or a 1 troy ounce rhodium bar. I haven't contacted Eitan Cohen about pricing. He is, as you can guess, a very busy man! When the 1 gram rhodium bullion coins came out they were priced at $90 when rhodium was around $1500. Now that rhodium is around $2300, the coins are selling for $125. 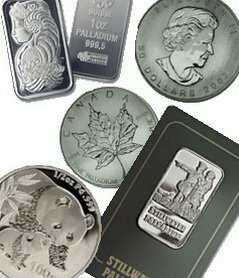 For my prediction, I'm guessing the 1 ounce bars will be around $2900 with rhodium at the price its at today. I would say the 1/4 coins will be around $800. Now don't quote me or plan on these prices. These are my guesses and I wouldn't be shocked if I were off by as much as 20%. UPDATE: the 1/4 ounce rhodium coins are selling for around $880 and the 1 ounce bars are $3300. The only problem is I ordered a coin in July, have written them several times. Have tried to call and have not gotten a response. Credit card was charged in July no merchandise. I put in what I think was a big order, over $14,000.00 going on 4 months now and only got 1/3 of it. Now it seems that I dont exist to The Cohen Mint and it seems like they dont exist becaues no one returns calls or emails. Anyone know WTF is going on with them? Hey guys. I've gotten a lot of mails regarding the Cohen Mint being slow. Eventually, it seems, that everyone who'd been complaining, though, stops. So I'm guessing everyone has received their orders? I put in an order for my rhodium in appx October, and I got my rhodium bar in appx December, I think. It was a long wait but now I'm one of the few people in the world to own rhodium! Article Summary: 'New Normal" for the Gold Price? Why the Gold Price Increase to $1,120 an Ounce?